Drilling and microfracture lead to different bone structure and necrosis during bone-marrow stimulation for cartilage repair. "Bone marrow stimulation is performed using several surgical techniques that have not been systematically compared or optimized for a desired cartilage repair outcome. 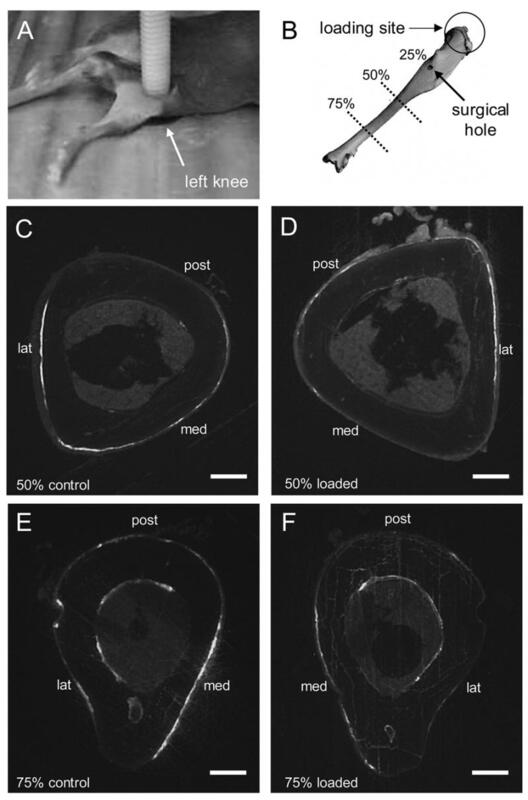 In this study, we investigated acute osteochondral characteristics following microfracture and comparing to drilling in a mature rabbit model of cartilage repair. Microfracture holes were made to a depth of 2 mm and drill holes to either 2 mm or 6 mm under cooled irrigation. Animals were sacrificed 1 day postoperatively and subchondral bone assessed by histology and micro-CT. We confirmed one hypothesis that microfracture produces fractured and compacted bone around holes, essentially sealing them off from viable bone marrow and potentially impeding repair. In contrast, drilling cleanly removed bone from the holes to provide access channels to marrow stroma. Our second hypothesis that drilling would cause greater osteocyte death than microfracture due to heat necrosis was not substantiated, because more empty osteocyte lacunae were associated with microfracture than drilling, probably due to shearing and crushing of adjacent bone. Drilling deeper to 6 mm versus 2 mm penetrated the epiphyseal scar in this model and led to greater subchondral hematoma. Our study revealed distinct differences between microfracture and drilling for acute subchondral bone structure and osteocyte necrosis. Additional ongoing studies suggest these differences significantly affect long-term cartilage repair outcome." This study puts a huge dent on tapping-style LSJL. There are some confounding variables, one is that the microfracture produced by tapping bone may not be the same as the one they caused on the rabbits. Second, the rabbits were only killed after one day so we don't know if any healing or adaptation occurred as a result of the microfracture. Third, load-style LSJL increases intramedullary pressure which can get those stem cells to the growth plate in spite of the network being "less clean" than with drilling. 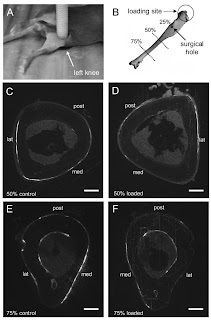 Effects of surgical holes in mouse tibiae on bone formation induced by knee loading. "Loads applied directly to the knee (knee loading) have recently been demonstrated to induce anabolic responses in femoral and tibial cortical bone. In order to examine the potential role of intramedullary pressure in generating those knee loading responses, we investigated the effects of drilling surgical holes that penetrated into the tibial medullary cavity and thereby modulated pressure alteration. 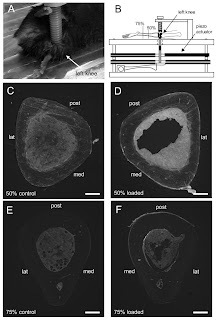 Thirty-nine C57/BL/6 female mice in total were used with and without surgical holes, and the surgical holes were monitored with micro CT and histology. The left knee was loaded for 3 days[at 5Hz at 0.5N for 3 min a day], and the contralateral limb was treated as a sham-loaded control. Mice were sacrificed for bone histomorphometry 2 weeks after the last loading. Although the surgical hole induced bone formation in both loaded and non-loaded tibiae, due to regional and systemic acceleratory phenomenon the anabolic effect of knee loading was substantially diminished. Without the holes, knee loading significantly elevated cross-sectional cortical area, cortical thickness, mineralizing surface, mineral apposition rate, and bone formation rate on the periosteal surface. For example, the rate of bone formation was elevated 2.1 fold (p<0.001; middle diaphysis--50% site from the knee along the length of tibiae) and 2.7 fold (p<0.01; distal diaphysis--75% site). With the surgical holes, however, knee loading did not provide significant enhancement either at the 50% or 75% site in any of the histomorphometric measurements (p>0.05). The results support the idea that alteration of intramedullary pressure is necessary for knee loading to induce bone formation in the diaphysis." Now they do say however that the drilling of the epiphysis did induce a response of the bone just not the same adaptations as it did without drilling. Now notice that they used drilling rather than microfracture. It is possible that the clutter perceived so negatively in the first study by microfracture could in fact help increase the intramedullary pressure which accelerates the rate of bone formation. Now this study was available for free and there were some pictures of bone loading with and without drilling. Note that in group D which is the loaded group there is a huge hole in the middle of bone indicating that LSJL may in fact cause bone degradation which would allow for cartilagenous growth plates. The fluid flow degrades bone and osteomy(removal of bone) may be necessary for new chondrogenesis. It's possible that this degradation of bone occurs in the epiphysis as well. Note that this data was taken 11 days at the end of loading. In group F the whole is smaller likely due to that LSJL was stopped after 3 days. In this group both C and D have holes but in group F versus E the hole is much bigger. So LSJL preserves holes created by stimulus. Unfortunately this study was performed before Yokota and Zhang realized that Lateral Synovial Joint Loading could be used to increase bone length so they didn't measure the things that would interest us height seekers like stem cells or if the tibia and femur had increased in length.
" knee loading induces alteration of intramedullary pressure in the femoral bone cavity and that this alteration is synchronous to the loading frequency in Hz"<-The higher the frequency, the greater the intramedullary pressure. You can alter the loading frequency by LSJL by rapidly clamping(and possibly unclamping as well). "cyclic deformation of the epiphysis alters pressure in the medullary cavity and the pressure gradient induces fluid flow in the diaphysis "<-so pressure gradient influences fluid flow so you can't totally alter the two factors of pressure(which can induce chondrogenesis) and fluid flow which can increase nutrient supply to chondrocytes. "In the presence of surgical holes, it is expected that the gradient is not adequately established because of incomplete pressure sealing." then you do not eat meat? Are these researchers using pictures from a paper in another paper? For instance, you can see the picture of the same mouse with drilling in "Knee loading stimulates cortical bone formation in murine femurs"